This is an era of divisive U.S. politics. The House and Senate are split between Democrat and Republican control. President Trump has very firm ideas on policies he wants to implement. There will be another election next year (do they every stop campaigning?) which means less chances the two parties will want to give the other opportunities to declare a “win”. Finally, the federal government fiscal year closes out at the end of September. In theory, Congress must pass, and the President must sign a spending plan before then end of September to fund the government for the next twelve months. This scenario of conflict between the branches of government doesn’t seem likely to soon end. That means the potential of another government shutdown at the end of 2019 or early 2020 is a real threat and needs to be considered in your investment strategies. The first thing to remember is that a Federal government shutdown is not the crisis the news outlets and politicians will try to make you believe. The government won’t put itself out of business, and every person or entity that counts on Federal payments will be made whole after any shutdown gets reopened. The result is that any government shutdown effect on stock market prices will be due to fear based selling not based in the financial realities. Over the course of 2019 I have been advising my subscribers to build up their defensive cash positions. 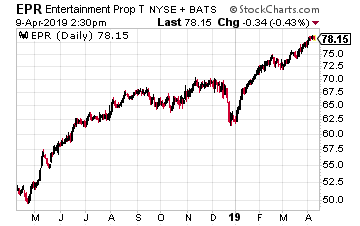 The bull market is climbing on shaky steps and any type of non-recession based correction will be a time to pick up shares of high quality dividend stocks at lower prices. Here are three stocks that I would recommend if a government shutdown resulted in stock price declines. Easterly Government Properties, Inc. (DEA) is a real estate investment trust (REIT) that exclusively owns properties leased to federal government agencies. As noted above, even if a shutdown causes a temporary stop in payments to vendors and companies like Easterly, when the shutdown ends all the missed payments would be made good. 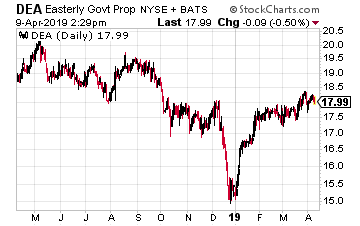 Shares of DEA yield 5.7% and if a share price drop drove that yield up above 6.5%, it would be a great time to lock in an attractive yield 100% backed by the Federal government. A government shutdown could disrupt the residential mortgage business. Most new mortgages are guaranteed by some government agency such as Fannie Mae and Freddie Mac. 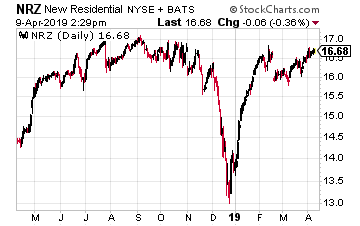 If mortgage related finance REIT share prices take a dive, I would be adding shares of New Residential Investment Corp. (NRZ). Most of New Residential’s business is shielded from the new mortgage origination side of the sector, that that would not likely prevent fear based selling. NRZ currently yields 12%. If federal employees don’t get their paychecks, they won’t be able to go to the movies or play TopGolf. This thought process could lead to a sell-off in EPR Properties (EPR). This REIT owns a portfolio of megaplex theaters, entertainment complexes and dedicated entertainment properties, such as TopGolf facilities. EPR has an outstanding history of annual dividend increases. It also is a monthly dividend payer. Current yield is 5.7%. If the price drops to push the yield up to 6.5%, back up the truck. They’re approved by Congress and Americans are collecting checks every month for $2,123... even $9,586. Everyone is asking me about income right now, I’m pointing to venture royalties. Here’s how to collect 14 royalty checks this year. Click here. Author: Tim PlaehnTim Plaehn is the lead investment research analyst for income and dividend investing at Investors Alley. He is the editor for The Dividend Hunter, an investment advisory delivering income investments with double digit growth in share price and dividend payments, and 30 Day Dividends, a specialty income service that takes advantage of opportunities for relatively fast, attractive profits around potential dividend payouts. Prior to his work with Investors Alley, Tim was a stock broker, a Certified Financial Planner, and F-16 Fighter pilot and instructor with the United States Air Force. During his time in the service he was stationed at various military locations in the U.S., Europe, and Asia. Tim graduated from the United States Air Force Academy with a degree in mathematics. Learn about Tim's new investment strategy for collecting income from the market each and every month without the use of options, futures, forex, covered calls, or risky trading strategies.